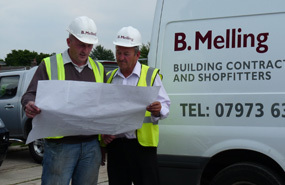 Today B Melling Builders is recognised as one of the leading building and fit-out commercial contractors to the North West of the country, a status gained by combining highly experienced project management personnel with a team of professional tradesmen who are all highly experienced, fully qualified and trained to the most exacting standards. It’s a formula that allows the business to carry out a wide and diverse range of building projects. Over the years these have added up to an impressive portfolio of completed work, all of which has been undertaken with the company’s trademark level of highly personal service. Despite over three decades of experience as a commercial building contractor, company founder Brian Melling’s enthusiasm for the business is a strong as ever. Which is why he remains totally hands-on and fully involved with day-to-day client contact and the overall running of the business. Today the company includes an eighteen-strong team of highly skilled craftsmen, many of whom have been with the company for over 20 years and who are trained and experienced in areas that cover all aspects of the building trade. It’s a tight knit, highly professional team, capable of taking on a wide range of construction projects...from simple small works schemes up to complex new build commissions with budgets of up to £2 million or more. The business has excellent links with local authority schools in the Greater Manchester and Cheshire areas and has forged strong and productive associations with a number of blue chip surveying and architectural companies. However, much of the work undertaken – in fact, over 90% in total – comes from existing client . . . a trend that confirms the company’s reputation for outstanding service and which reflects the desire to remain a relatively small and manageable business capable of always delivering a reliable and personal service. But, despite the compact nature of the team, there is always room for fresh skills. That’s why the business supports the need to employ young trainees who benefit from apprenticeship schemes at local colleges and a level of on-the-job-training and one-to-one mentoring that has helped them develop into professional tradesmen. Health & Safety is of paramount importance to B Melling Builders. Safety Management & Management Safety and CHAS.